Sun Cellular Philippines - Revealed the new postpaid plan for only Php99 per month, an affordable plan for daily communication needs. The 99 pesos amount is fully consumable, which can be used in all SUN Cellular offers. A great offer for the budget aware, and people who only uses call and text from time to time. Why budget? By using simple math 99/30 which will only equals to 3.3 pesos per day. 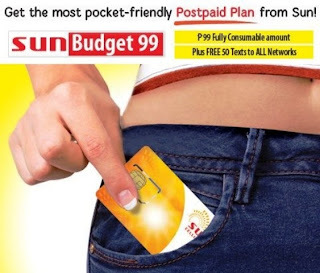 How To Subscribe for SUN Budget Plan 99? Note: The plan is SIM only, which means it doesn't come with a free phone.